What's so bad about Peanut Butter? Most brands of peanut butter have 1 gram of sugar per tablespoon which isn’t a huge deal....if you can stick to one tablespoon. Really, it’s the extra stuff in it that concerns me. 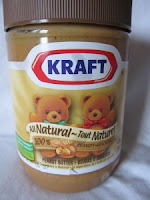 For one thing, I was really surprised to find out that our favourite brand of peanut butter, Kraft, was made with soybean oil...a product that I now avoid. The other problem with peanut butter is mold. I know…nothing is safe anymore.... Just close your eyes and scroll down a bit if you don’t want to know about Aflatoxin. More than 99 percent of peanut farms use fungicides to treat mold. Aflatoxin is a compound that is produced by molds that grow on nuts, or legumes in this case, and it can be carcinogenic in large quantities. Aflatoxin can also be made worse by improper storage and handling. So basically, if you love peanuts and peanut butter, you have to pick your poison…..pesticides or Aflatoxins. While there are no genetically modified peanut on the market yet, you can be sure it won’t be long until we see mold resistant peanuts. There are a couple of better options though. If you can, buy peanut butter made from Valencia peanuts. These are smaller and sweeter and grown in dry climates where Aflatoxin is not as prevalent. Another solution is to buy nut butters made from tree nuts, like almonds, where mold is not as big of an issue. If you do buy peanut butter, buy organic peanut butter from stores that have a high turn-over rate. 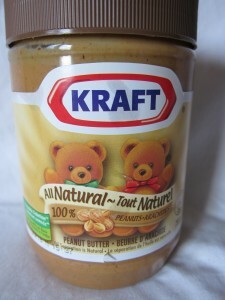 You can find several 100% peanut butters (most are in your grocery store’s health food section) like this one by Kraft. I loved all natural peanut butter right away but it took about a year for Sugar-Free Teen to finally warm up to it. I'm glad I held my ground on this one as I don't want my family consuming genetically modified soybean oil peanut butter! Like all 100% peanut butter, the oil separates and rises to the top. For some reason, this is very alarming to some people. Of course if a nut butter doesn’t separate….that should make you wonder why. 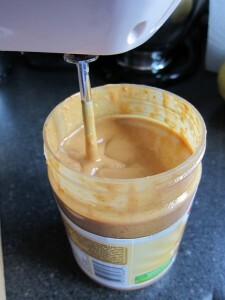 Empty your peanut butter in a bowl and mix by hand or use one beater on your hand mixer. Hold on dearly to your jar and blend your peanut butter, slowly lifting the beater up to halfway (avoid major splatters). 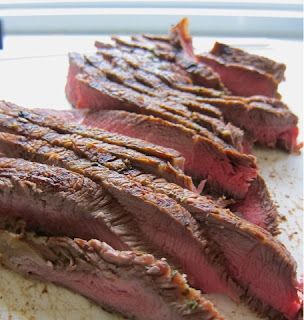 For my family, I always add a little bit of salt (1/4 tsp) and a little honey (1 tbsp). By the way, don’t try taking photos of yourself doing this with one hand holding a camera. It won't turn out well! There are several organic peanut butter brands that can be found in the health food section of your grocery store or at your gourmet grocer. 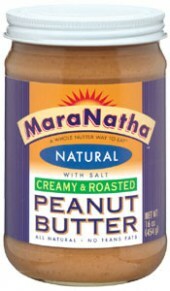 MaraNatha has a variety of nut butters to choose from including : organic, “no-stir” and ” hint of salt”. The organic peanut butter is 100% organic dry roasted peanuts. The Natural Peanut and Organic Peanut Butter "with salt" is also a good choice...Ingredients: Dry Roasted Peanuts and Sea Salt. Artisana is another wonderful (but expensive) artisan of nut butters. If you've never had the cashew butter....well, you have no clue what you're missing out on....oh...and the coconut butter..sigh. Sorry. I got completely sidetracked. 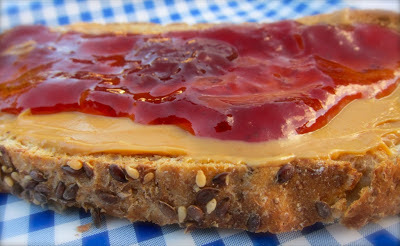 Justin's is another popular PB artisan brand. Like Artisana, they also sell single-serving PB packs. Great for work lunches. Crunchy or Smooth Peanut Butter. Priced at under $4.29, Often on sale. Works for many. Ingredients: Freshly roasted organic peanuts. Nuts to You Nut Butter, located in Paris Ontario, makes many different types of nut butters, including organic, raw, and alternative nut butters like cashew, almond, hazelnut, sunflower, pumpkin, tahini, and macadamia. They also make the valencia peanut butter I talked about earlier. Because these jars are so expensive (about $11 per 500ml), I tend to only use them in my baking. 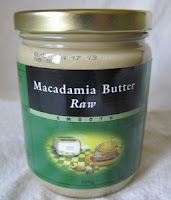 For instance, I love using this raw macadamia butter in my homemade oreo cookie filling! YUM! Peanut butter is a staple for me. Thanks for the great info! I'd love to hear your thoughts. Please comment below.